Last Sunday, my beau finally gave in to one of my requests -- to visit Mercato Centrale. Although we weren't able to really enjoy the experience as we walked from Bonifacio High Street's parking lot to MC Home Depot under the scorching heat of the sun at high noon, I finally got to try one of the reasons why I've long wanted to visit this food bazaar -- My Pink Wasabi's Kashi Maki. A combination of 2 things I love -- Japanese cuisine and sweet desserts, these Kashi Makis are mini cakes meticulously hand-rolled into small bundles of goodness. My date bought me 2 orders of the 5-piece Kashi Maki samplers (P130) which had a piece each of the Marula, Midnight Mint, Oolong Berry, ChocoLocco and White Matcha flavors. 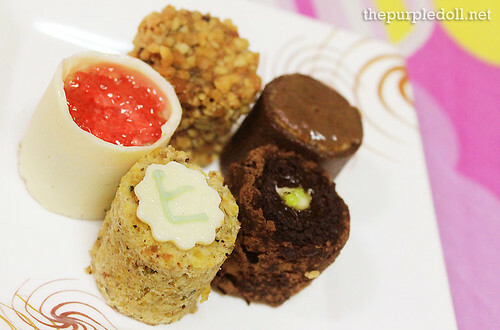 Each flavor from the sampler was good and the base cake was incredibly moist even after sitting in the fridge for some time, but what I love about them is their right amount of sweetness, coupled with a seemingly nutty taste. They're perfect meal enders or quick snacks. And although I loved each one of the Kashi Makis I got to try, I still had my own set of favorites -- Marula (rich, creamy and very chocolatey), ChocoLocco (very nutty inside and out) and Midnight Mint (rich, creamy and minty). I may not have personally greeted and thanked Chef Anna and Chef Ken for their wonderful creations (I do blame the heat of the sun for making me a little cranky that day), but I'm very sure this isn't the first and last time I'll have My Pink Wasabi's Kashi Maki. This is so mouth-watering! I really ought to go to Mercato Centrale. I keep on hearing good things about the foods there! Ayan dapat ma try ko yan kashi makis na yan! Tsalap ng picture at ng description mo Sumi! Verdict: magkamatayan na, di na ako babalik kahit kailan. I tried a couple of their "sushis" before but they weren't too memorable for me. Perhaps it's because the samples they gave out at UTT were too tiny. Pink wasabi! Name pa lang yummy na! Haha. For sure my bf will love this. :) I'll have him read your blog later. :) Para we can try this together. parang nakakapangigigil mga itsura..sarap na sarap na ako sa kanila..
ChocoLocco looks yummmy! Pero parang ang cute din nila masyado para kainin. Hahaha! if this is how wasabi looks like... kakainin ko silang lahat... but if I tasted wasabi in any of them... pass na ko... hahaha. Yahweh bless. i've been wanting to try pink wasabi, kaso it was too far naman.. I've been to Mercato once but i have not spotted the pink wasabi.. maybe this year i should definitely come back at mercato..
Wow, seems so interesting to visit and try this foodies--though I am not a fan of sweets, but it doesn't mean I can't eat it at all. Perhaps, this time I would try it once I get back. I've still not yet been to Mercato Centrale! Sigh. Hope to try this yummy and cute maki -- soon! ahh my goodness! looks yummy! My lil one is a hard fan of maki! I'll let her this post and I'm sure what is going to happen after. Hahaha Thanks for posting! Will try mercato centrale soon! 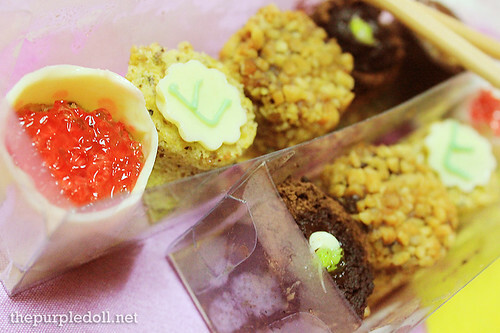 you presented it beautifully.. they're too cute and it's quite a shame to eat it. Pink wasabi is worth trying for sa mga food lover and blogger .I haven't tried pink wasabi yet and never been to that place. They look delectable! Too bad, BHS is so far from me! Hayy! Aww!! that looks so sinful but I sure won't mind trying them out. I haven't been to Mercato yet...wahhh! I want to try this SO BADLY! I'm not sure if I'm right, or maybe I love under a rock, but from first glance these cakes look so unique (in an interesting kind of way). it's better to visit mercato at night - cooler! :) gotta try those cute and unique desserts! Mercato Centrale is the bomb! We usually go there at the midnight market.. :) Nice photos and blog! wow ang sarap hehe thanx for sharing..
Looks good! Must give this a try.